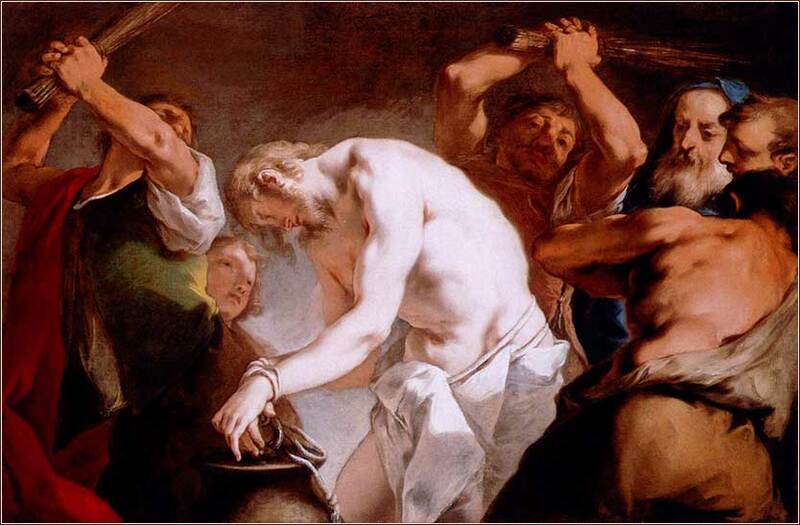 Flagellation of Christ by Nicolò Grassi, ca. 1720. Grassi portrays impending violence, the instant before the first scourge hits Jesus, with convincing realism. But he gives Christ symbolically pale skin, to convey innocence and purity. If you are using a Kindle or smartphone, and have ever had a problem hearing the music, please see the “How to” on Page Two. Oh Father God in heaven: What a great day! Thank you, thank you, thank you for this and every day when I have woken up, with my heart beating and my mind able to read and think. Whatever physical limitations I may have, whatever aches and pains or illnesses I have this day, they can never diminish the greatness of life itself and the great world in which I have found myself. By the power of your Holy Spirit, fill my heart with joy for all that I have been given. Help me to shoulder the burdens of my life with strength and courage, finding my solace in your promise of eternal life. I look forward in absolute faith to the glorious new body that all of Christ's children have been promised; but I pray to enjoy this not-so-glorious body, to see all of its wonders and remember that, being a gift, I am in no position to complain about its imperfections. Let me celebrate today all the little things I take for granted. And bless all the people of this earth, O Lord, with the joy of gratitude for their life; and I pray that their gratitude might lead them to your holy Gospel, that they may someday know the life eternal, which can come only from your Son, Jesus Christ. 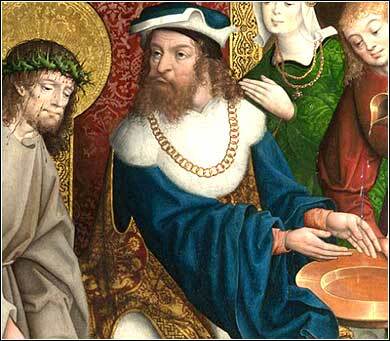 Pilate Washing His Hands, Master of Cappenberg ca. 1520. So when Pilate saw that he was gaining nothing, but rather that a riot was beginning, he took water and washed his hands before the crowd, saying, “I am innocent of this man's blood; see to it yourselves.” And all the people answered, “His blood be on us and on our children!” Then he released for them Barabbas, and having scourged Jesus, delivered him to be crucified. This short narrative is loaded with meaning. There are four characters, and an examination of them gives us parallels for our own lives; for they all live within every one of us. The soldiers are a pack of hyenas. Scourging consisted of whipping the subject's bare back with a lash studded with sharp bone and lead; many died from it, for it tore the subject's back into shreds. The soldiers, those who actually scourged and mocked Christ, are the bullies of the world, people with no conscience or scruples at all, whose amusement is bloody violence and the torture of the weak. They are the incomprehensible human capacity for animal violence that lies deep within each of us. Psalm 22 likens them to bulls and lions, and the comparison is not meant to be complementary. The second character, the crowd calling for his crucifixion, is a testament to social pressure; our tendency to take our values from those surrounding us rather than our own values; for many in the crowd were Jesus' supporters only a day before. A mob is the ultimate embodiment of peer pressure, the compromise of personal values to conform to those around us. We see it today, specifically, whenever we compromise Christ in order to “get along” in a secular society with no moral compass. The third character, Pilate, represents hypocrisy. In his handwashing, we see a perfect parallel to the “whitewashed tomb” of the Pharisees. It is ritual without meaning. It cannot possibly affect his spiritual culpability in allowing Jesus to be crucified. And he is surely culpable, for the Sanhedrin had no control of the Roman soldiers and no power to impose the death penalty. And our final character is Christ. The King of Heaven, the Son of God, humbles himself to the very bottom of the human totem pole: could there possibly be anything worse, in individual terms, than being thrown to a pack of human jackals to be mocked and tortured to death? It is the ultimate act of love, for Christ is the most powerful man ever to dwell on earth, who willingly gives himself to the worst fate imaginable, so that we might be saved.